With five years to go before Brazil hosts a golf's return to the Olympics, Colombia’s Mariajo Uribe gave the women’s game in South America a significant boost by winning the HSBC LPGA Brasil Cup in Rio de Janeiro. Tim Maitland reports. 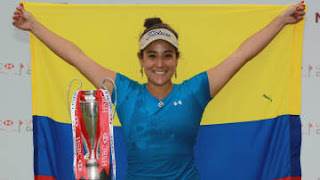 The twenty-one-year-old from Bucaramanga gained her first victory as a professional shooting a 9-under-par 135 for the US$720,000 two-round event at the Itanhanga Golf Club in the Barra de Tijuca district of Rio. Uribe, the 2007 U.S. Women’s Amateur champion, won by a stroke from Australian Lindsey Wright who narrowly missed a seven-foot breaking putt to force a play-off. “It’ll make a huge impact on South American golf, especially women’s golf. With the Olympics coming up we need a lot of representatives from South America, so I think it’s a big deal,” said Uribe, who enjoyed enormous local support during her six-under-par final round. Uribe added that even though the tournament is not considered an official LPGA event win and the prize money doesn’t count on the tour’s money list, it is playing a significant role in a country that, despite its population of 200 million, only has 25,000 golfers. “A lot of the kids I saw last year are training more because they met me and they have someone closer to relate with. I think my win is going to create a huge buzz,” Mariajo said. The President of the South American Golf Federation (the Federacion Sudamericana de Golf) and of the Brazilian Golf Confederation (the Confederacao Brasileira de Golfe), Rachid Orra said Uribe’s victory was as significant to the region as Jhonattan Vegas’ victory at the Bob Hope Classic in January; even though Vegas’ win has single-handedly changed Venezuela president Hugo Chavez’s attitude to the sport. “Symbolically it’s the same thing because it’s a girl that has beaten some of the best players in the world!” declared Orra. “It’ll be all over the newspapers in Brazil that South America has one girl, and others, that can compete equally with some of the best players. It’s a great thing that one girl from South America has beaten some of the best players in the world. It’s very important for us. It’s an example for the young girls that want to play golf to see one girl from Colombia, a country like Brazil, can win a very important tournament. We are very happy. The coming of the HSBC LPGA Brasil Cup was a very important step for us, taken three years ago. This is another one. Both are very, very, very important,” he explained. Uribe’s victory is South America’s first at the LPGA level since Paraguay’s Julieta Granada scooped the million dollar jackpot at the ADT Championship in November 2006. The last Colombian win was Marisa Baena’s 2005 triumph as a complete outsider in the HSBC Women’s World Match Play Championship in 2005. “Golf in Brazil and in the region is at such an embryonic stage that every step in the right direction, every little thing that gains attention and increases the interest to a broader audience, is of enormous importance,” said David Kotheimer, Deputy CEO and Vice Presidente of tournament sponsors HSBC Bank Brasil. “The sport has been so energised here by its introduction to the Olympics and the prospect of its return in the 2016 Rio Games, but a ‘local’ win at the HSBC Brasil Cup will still play a substantial part in fanning those flames even more. This event really can be a catalyst, just as the WGC-HSBC Champions has been a catalyst for growth in China. That was the strategy behind investing here just as we have in Asia,” he added. Relatively forgotten in the excitement was the performance of the thirty-one-year-old Wright, who was overjoyed at getting back into contention for a title for the first time since she finished runner-up at the LPGA Championship, one of the women’s Majors, in 2009. “To finish second and to have a chance of winning was awesome; just for my confidence. I felt really pleased because I went for every shot. On the last hole I went for it, pulled off the shot and nearly holed the putt. I was happy to be in that position; really happy to get the nerves and that “Yeah! This is great!” feeling… and I haven’t had that feeling in a long time,” Wright said. Two of the world’s leading golfers landed in Rio for the HSBC LPGA Brasil Cup with a simple message for the sport: “Next Stop: Olympics - Let’s grab this opportunity with both hands”, Tim Maitland reports. World number two Suzann Pettersen and number four Cristie Kerr believe Rio 2016 represents a once in a lifetime chance for the sport to establish itself in a country where less than one in every eight thousand people currently play the game. Less than a week after battling it out in the final of the Sybase Match Play Championship in New Jersey, Pettersen and Kerr sat on lounge chairs sipping glasses of fruit juice on Botafogo Beach, hoping it would be the last occasion they will have time to enjoy Rio de Janeiro’s sun-kissed sand. “We’ve got five years before we return for the Olympics in Rio and the HSBC LPGA Brasil Cup is the one foundation stone our sport has to build on,” said Pettersen, in the build up to this weekend’s two-day, limited-field event at the Itanhanga Golf Club. “We can’t miss this opportunity!” declared the Norwegian, who was one of the team that successfully argued the case for golf’s return to the IOC two years ago. “Sitting in the shadow of Sugarloaf Mountain is spectacular and Rio is stunning, but if we’re going to grasp the Olympic opportunity we have to continue to grow here. We’ve got the best field of women’s golfers Brazil has ever seen, so this week is already a success but we need to keep getting bigger,” added Kerr, aware that golf needs a bigger base than the 25,000 players among the estimated 200 million people who make up the world’s fifth most populous country and a nation that boasts one of the fastest-growing major economies in the world. Kerr and Pettersen also spent time swapping tips on bunker play with children from the R&A-funded Japeri Project, a community programme that is developing over 100 young golfers from one of the poorer areas of the city. “Both Brazil and golf needs the kind of top-and-bottom approach that we have traditionally taken with our golf sponsorships in Asia and around the rest of the world. The sport needs growth in number of participants and it needs to spread demographically,” said Giles Morgan, HSBC Group Head of Sponsorship. Note: Columbia's Mariajo Uribe won the HSBC LPGA Brasil Cup, which took place the weekend of 28th and 29th May. The Brazil Cup, an unofficial two day event, offered prize money of US$720,000 and attracted four Major champions and twelve LPGA tournament winners in the thirty player field. Uribe won by a single stroke over Lindsey Wright. Getting a grip on technology using golf gloves? Is it considered an unfair advantage during a round to improve your grip with the help of a golf glove? The meaning of "bionic", as defined by Dictionary.com is "utilizing electronic devices and mechanical parts to assist humans in performing difficult, dangerous, or intricate tasks, as by supplementing or duplicating parts of the body." The Six Million Dollar Man was recreated after an accident with technologically advanced replacement parts to help give him a superhuman advantage...to run faster and jump higher in order to rid the world of undesirables. Claims in a press release issued by the Bionic® golf glove company stated that their glove is a "piece of game-improvement equipment and not just a golf accessory or apparel item." "The biggest difference is felt when you play a round with Bionic, " said the release. "Research at the renowned Pinehurst Golf Academy showed that most golfers who used Bionic gloves gained six yards of driving distance." Although the golf glove conforms with USGA rules, would I feel comfortable playing golf against someone who used the Bionic Glove in order to gain an advantage? Golf club manufacturers tout their use of game improvement technology for the average player so why not use a golf glove to do the same? While there are golfers using the Bionic Golf Glove during a round, players are also practicing with the new SensoGlove, "the World's First Digital Golf Glove" to give feedback on grip pressure, "in real time." The SensoGlove is being used as a training aid by PGA Instructors to help stave off the dreaded "death grip". The golf glove has built-in digital sensors which gives feedback of the grip in real time, right down to the sensitivity of each finger on the golf club! The only problem that I see with this technology is that, during practice, players tend to be less agitated so their grip doesn't necessarily reflect the same nerves as during play, no matter how much one tries to recreate it! Arnold Palmer said his father "put my grip on the golf club when I was six years old and he said, 'Boy, don't you ever change it.' Well, I haven't changed it." "Your hands are your only physical link with the tools of the game," Palmer relates. "If they don’t transmit your energy properly to the club and thence to the ball, you won’t hit much of a shot." Instead of using technological enhancements to improve this aspect of a golfer's game, wouldn't simple consistent grip practice make perfect? You can decide for yourself if either golf glove is right for you by visiting the Bionic and SensoGlove websites. Golf tips and Acupuncture to help prevent injuries and improve your swing! Age, repetition of common motion, stress, tension and desk jobs can inhibit flexibility and range of motion, which directly impacts a golfer’s game and leads to sub-par performance. Dwayne Lee L.Ac , acupuncturist, avid golfer and specialist in golf-related injuries at PLACE360 Health + Spa in Del Mar, CA., helps golfers enhance flexibility in order to gain range of motion and rotation. 1. Flexibility: Most golf related injuries can be avoided by keeping muscle and connective tissue warm and pliable. Crucial are low back, hips, shoulders and upper torso. Take a fifteen minute pre-round stretch to avoid having to take weeks off the course due to back strain. 2. Strengthening core/abdominal and the big upper leg muscles will prevent undue stress on the back and arms. Keep the center tight and the centrifugal force of your swing will be safer and more powerful. 3. Avoid tendonitis. Don't over-squeeze. Keeping the hands and forearms soft until ball impact will reduce strain on the joints of your elbows and wrists. Let your muscles do the work to avoid the dreaded tennis or golfer's elbow. 4. Not enough time to stretch? Are you running to the tee box? Then schedule an appointment with a trained massage specialist a day or two before your round to keep tight muscles loose and address problem areas before they complicate into bigger problems. This may be especially important on golf vacations or in tournaments when your body starts to tighten up after several rounds. Most golf resorts offer spa services for men and women with varying body types. 5. Balance is key. There are sets of acupuncture points on the hands and feet that can create better balance and muscle sequencing. These points can be stimulated with magnetic pellets or tiny tacks that will adhere to your skin for an entire round, helping you stay on plane and over the ball or better accuracy and better impact. 6. Acupuncture is also great to keep connective tissue pliable and healthy as well as reduce inflammation of joints from repetitive overuse. Super fine needles are non-painful and are strategically placed to release spasmed and stubborn muscles. Acupuncture is also proven to be especially helpful for joint problem areas in the wrists, ankles, knees, elbows, back or neck. Acupuncture is a form of traditional Chinese medicine that is thousands of years old and involves inserting and manipulating needles into various points in your body to relieve pain and help restore the balance of yin and yang. The Golf Series package at PLACE360 Health + Spa was designed to increase or maintain a golfer’s flexibility while improving power and the overall game. A combination of acupuncture, massage and relaxation techniques help get golfers back out on the course while lowering their handicap. Although I have never tried acupuncture, it has been in practice for thousands of years. Seeing that KJ Choi has met with some success using acupuncture...I'm open to discussion! historic Stanley Thompson Course at The Fairmont Banff Springs, Canada, July 25th to 26th. Golf enthusiasts worldwide can enjoy a head start on the PGA Tour professionals with the resort's "Play Before the Pros" vacation package. Known as the "Castle in the Rockies," The Fairmont Banff Springs is located in the heart of Banff National Park and is styled after a Scottish Baronial Castle, offering commanding views of the surrounding Rocky mountains and the stunning Bow River. Just steps from the charming village of Banff, the Fairmont Banff Springs resort is a National Historical Site and offers a tremendous blend of luxury and recreation. In addition to its two golf courses (Stanley Thompson 18-Hole and Tunnel nine), The Fairmont Banff Springs offers exceptional dining and shopping options in addition to a Willow Stream Spa and a host of additional recreational activities. One of the most memorable Telus World Skins Game was hosted at The Fairmont Banff Springs in 2006. Five decades of golf personalities were represented: Jack Nicklaus, Greg Norman, John Daly, Stephen Ames and Sergio Garcia but it would be John Daly who hoisted the trophy taking nine skins and $210,000. This year, Telus World Skins Game partners with Nike Golf with the field all belonging to Nike athletes: Anthony Kim Paul Casey and Stephen Ames have already been tapped with two other PGA Tour golfers being announced shortly. The golf event is owned and operated by IMG in Canada. If you are fortunate enough to visit Canada to attend the 2011 Telus World Skins Game and stay in the fabulous Fairmont Banff Springs, the visuals...scenery as well as the old world charm of the hotel, will surely take your breath away! Was age a factor in David Toms defeat at The Players? While watching the final round of The Players Championship, I heard an announcer question whether or not David Toms could go the distance this particular Sunday, a long, tiring day in which both third and final rounds were being decided. Because of his age, would Toms tire as he progressed through the back nine? I reacted by posting a similar question to Twitter but without the age variant, wondering if Toms could hold on for the nine remaining holes to win The Players. Responses ranged from simple yet effective "yes" to "yes, he is cagey" @BobFriend_golf. No one mentioned that age may play a factor in his defeat. And why should it? Forty-four year old Toms is certainly not old yet he has had his share of career-limiting physical ailments. Even so, age was not the reason why David missed a three-footer on the first playoff hole at TPC Sawgrass, handing over a well-deserved win to K.J. Choi. His wife Sonya's telltale thought, "You get to this stage in your career..." coupled with remarks from his caddie Scott Gneiser, "He got to the point where he was maybe kind of going through the motions," spoke volumes about what might have been rummaging through Toms' conscience. David even added that he was basically in the event to show his son how its done, not necessarily for himself. Age limitations do play a factor in every professional golfers career but not necessarily in a physical sense. The lingering question as to "how much good golf is left?" may creep thoughts into the mental game in a sport where the median age on the PGA Tour is 30-35 years-old. Mistakes also come easier as older golfers choose the wrong shot, thinking they can still "go for it" realizing afterwards that a safer approach may have yielded far better results. The right attitude can help diffuse the signs of aging. After forty-six-year-old Paul Goydos' third-place finish at The Players, he made reference to his age but also that this finish is something that he "can build on," adding "I'm getting to that age where I need to find something to hang onto. I don't feel old"
"No, that's a lie. I feel old." Goydos continued, "But I didn't feel old until this year. Playing bad does that to you. I've got a great job, and I'm going to keep trying to do it." Goydos hit the nail on the head...playing bad and squandering chances make you feel old! Media plays up the angle of age versus youth as in the battle between 47-year old Miguel Angel Jimenez - Lee Westwood on the European Tour at the Ballantine's Championship. The strut and swagger of Jimenez forced naysayers to comment on the "coolness" of Jimenez not believing that age was a factor; Westwood merely performed better that week. That being said, with a fan base in golf getting younger all of the time, forty-something players like Toms are paving the way for a new generation of golfers like McIlroy, Fowler and Manassero. Kids identify with the coolness of the clothes, the connection on Twitter and the fact that their parents don't necessarily like the change. Hopefully, this infusion of youth will take the game to the next level. "You have to be very regimented in order to have a long career out here on the TOUR. I was able to focus, I was able to maintain physically and mentally my body very well. And I felt like I still had the confidence that I could play well out there. I train hard, I practice hard, and I think all the young players need to do that. And I think you need to live your life to the fullest. And when I say that, I don't mean partying all the time. Live a systematic, regimented life, always be humble. That's my motto." As for David Toms' performance this week at The Players Championship, he was the 36-hole leader and could hardly be considered "old". "No excuses, no spike marks, no ball marks, no nothing," Toms said of his three-putt bogey on the first sudden-death playoff hole. "Maybe a lot of pressure. But other than that, there was no excuse." Mickelson a candidate for World Golf Hall of Fame Class of 2012? Three-time major winner Ernie Els, former President George H. W. Bush, 19-time PGA Tour victor Doug Ford, Japan’s Masashi “Jumbo” Ozaki, the late Frank Chirkinian and the late Jock Hutchison were inducted into the World Golf Hall of Fame Class of 2011 in St. Augustine, Florida yesterday. WGHF Chief Operating Officer Jack Peter said, "The Class of 2011 comes from South Africa, Japan, the United States and Scotland. The global nature of this wonderful Class embodies so much of what the World Golf Hall of Fame stands for. We are thrilled to welcome all of them into the Hall of Fame family." 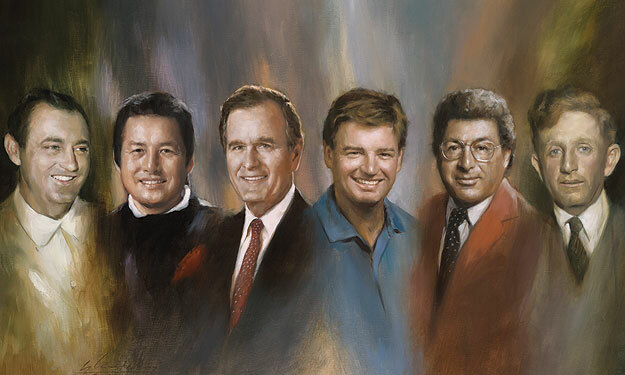 The World Golf Hall of Fame honors golf's greatest players and contributors. Criteria for induction indicates an honorary must be forty-years old, must be a PGA Tour player (on the PGA Tour ballot) for ten years and have either ten Tour wins, two majors or two Players Championships to be considered. Perhaps Phil Mickelson needs another Players Championship win under his belt before being added to the ballot? Ernie Els was interestingly enough inducted through the PGA Tour ballot and has won more than sixty golf tournaments worldwide. He has been a fixture on the PGA Tour, the European Tour and on six Presidents Cup teams. President Bush will become the second president inducted in the Hall of Fame, inducted through the Lifetime Achievement Category. CBS lead golf broadcaster Jim Nantz presented while the former President accepted his Induction in a pre-recorded address. Bush is the original Honorary Chairman of The First Tee and the Presidents Cup, as well as the recipient of the 1997 PGA of America Distinguished Service Award and the 2008 Bob Jones Award. The late Frank Chirkinian is known throughout golf and broadcasting circles as “the father of televised golf.” From 1959-1996, Chirkinian was the executive producer for golf on CBS and led its Masters coverage. Chirkinian, who was inducted through the Lifetime Achievement Category, is responsible for myriad innovations, including the installation of a camera on a blimp and adding microphones to tee boxes. The late Jock Hutchison was inducted through the Veterans Category. Hutchison combined with Jim Barnes and Walter Hagen to form the “American Triumvirate” during the 1910s and 20s. Hutchison is perhaps most famous for becoming the first U.S.-based player to win the Open Championship in 1921. Masashi “Jumbo” Ozaki, a Japanese legend who has won more than 100 times worldwide, was inducted through the International ballot. Ozaki led the Japan Golf Tour money list twelve times but could not make the Ceremony due to back issues and the recent events in Japan. Each Inductee has donated memorabilia from their standout career, which has been built into special Inductee exhibits at the Hall of Fame. Each Inductee will receive a case in Shell Hall and a permanent space in the Member Locker Room. The exhibits will be open to the public on May 10. What can Mickelson donate if he becomes an inductee into the World Golf Hall of Fame 2012? Perhaps a Masters flag, one of his three green jackets or maybe even one of his trusty putters? Tiger Woods ready-or-not for 2011 U.S. Open? Remember when Tiger Woods finished off Rocco Mediate in a playoff at the 2008 U.S. Open? He hobbled around the course wincing in pain from a torn ACL in his right leg. Prior to that, Woods won two additional U.S. Open tournaments, in 2000 and 2002, in both cases being the only golfer to score under par! Ahh, the good old days of the Tiger Woods mystique, when fans thought him to be an alien, a great guy and basically the most winningest golfer who one day would take more events than, and could be in line for, Jack Nicklaus' vacated throne. Then came the downfall and both Tiger Woods and the game of golf suffered immeasurably. Woods' comeback and attempt to win the 2010 US Open failed as he remained within reach but struggled for fourth place, a 4-over par score of 75, to tie with Phil Mickelson who grapples year-after-year with his own demons to conquer the US Open. Fast forward to May 5th, Cinco de Mayo, and Tiger Woods' Terminator-esque video statement, "I'll be ready!" "I personally contacted tournament officials and expressed my regret in not being able to play," Woods said. "This is an outstanding event, but I must follow doctors' orders to get better." A consideration as to whether or not Woods will enter the Players Championship or sit on the sidelines until the next major currently depends on his physical recovery but, with gossip mills churning out stories of Elin Nordegren "scoping for a new honey" and reports of how Tiger has been interfering in her private life, fans can see that the road to recovery is a long one. It was Tiger Woods' mental lapse, not necessarily his physical condition, that interfered with his game. It is interesting to note, however, that in spite of Tiger Woods' sprains and despite the fact that he has not won an event and has only placed in the top-ten two times this year, U.S. Open betting shows Woods to be an odds-on favorite (currently 11/1) at Congressional Country Club. Bubba Watson: America's newest golf and fan favorite? Loves Jesus and America too..."
Gerry "Bubba" Watson is fast becoming both a USA and PGA Tour 'best hope' as a young number-one player most likely to grab the top spot in the Official World Golf Rankings. Although it will take time to 'rule' the rankings and push past European Tour golfers, I was curious as to why Bubba is fast becoming a fan favorite. Can it be his social media conversation that engages fans? Although Watson's tweets are less than memorable, he still currently lays claim to over 122,000 followers. Bubba also shares videos with the fans and answers questions ...but he's no Ian Poulter! Bubba Watson Twitter profile? Christian, Husband, Pro Golfer who enjoys giving back to help others grow in life! Your welcome. "The Ronald McDonald House Charities, The First Tee of Northwest Florida, University of Georgia, PGA Tour, The Birdies for the Brave and The Green Beret Foundation." Bubba may not be the great communicator that helps drive Lee Westwood or Ian Poulter's fan base, so it may well be his golf game that draws the crowd. Watson has become a solid Tour golfer. After his second victory of 2011 came last week at the Zurich Classic and his third overall on the PGA Tour, fans are starting to cheer Bubba. Avid golf fan and Yahoo contributor Mark Paul gave a sense of the typical fan feelings about Bubba, "He is a popular golfer because of his style of play. But he is also becoming popular for his quality of play." Brett Martel , writer with the Associated Press added, "The lanky lefty's unorthodox swing and awe-inspiring power were already a draw." In my opinion, being a left-handed golfer with a huge "down the middle" drive certainly helps Watson stand out in a crowd. Combine these attributes with his Mickelson-esque family involvement and his determination to become a better man and Bubba has all the makings of a PGA Tour standout. Bubba was considered a bit of a "hothead" earlier in his career, "My wife, my caddie and my trainer would say my attitude's in the right spot," Watson said. "This week, I won [by] not getting down on bad shots, just staying focused on what I'm supposed to be doing." "All the bad boys are standing in the shadows...", Tom Petty, "Freefalling"
Perhaps it was the ability to manage his anger which turned around Bubba's golf game placing him in a position to win. "If I'm going to support kids and do charity work, that's not a good example to lead on a golf course," relayed Bubba. "So I still have backwards steps, but hopefully I take two forward when I take one back, and so far it's working." Sounds like Watson has finally stopped freefalling and is starting a forward motion which may make him unstoppable.